Slowing Growth Is the New Normal for Amazon.com, Inc. The law of large numbers could wreak havoc with Amazon's stock price in the next few years. After soaring to more than $400 in the last few months of 2013, shares of Amazon.com (NASDAQ:AMZN) have dropped 14% in the last few days. Investors and analysts had been expecting a blowout holiday quarter from Amazon, but the results and outlook did not quite live up to expectations. Amazon.com 6-Month Stock Chart, data by YCharts. Amazon's revenue grew 20% in Q4, or 22% if you exclude the effect of exchange-rate changes. The company expects a similar growth rate next quarter, with sales up 13% to 24% year over year. Clearly, it's a high-class problem for revenue to be growing "only" 20% annually. However, that's a big step down from the astronomical growth rates Amazon has posted as recently as 2011. Indeed, as Amazon continues expanding, its growth rate will continue to moderate due to the law of large numbers. Amazon investors should recognize that this slowing growth will be an ongoing theme for Amazon over the next five years. In investing, the law of large numbers states that the more a company grows, the harder it becomes for it to sustain its growth rate. At the extreme, as a company comes to represent a bigger and bigger chunk of the economy, its growth rate must eventually converge to the rate of GDP growth. This process is already evident at Amazon. Over the last three years, the company has more than doubled its annual revenue, growing from $34.2 billion in 2010 to $74.5 billion in 2013. In dollar terms, Amazon's sales growth has been very steady. The company added $13.9 billion in revenue in 2011, $13.0 billion in revenue in 2012, and $13.4 billion in revenue in 2013. Amazon's growth is slowing in percentage terms. However, in percentage terms, the declining growth rate is striking. In 2011, Amazon grew revenue by more than 40% year over year; last year, revenue growth was down to 22%. Amazon's slowing revenue growth (on a percentage basis) is very reminiscent of Wal-Mart's (NYSE:WMT) experience during the 1990s and early 2000s. When Wal-Mart was Amazon's current size, it too was growing about 20% annually. Yet revenue growth has been in a clear downtrend for more than two decades. 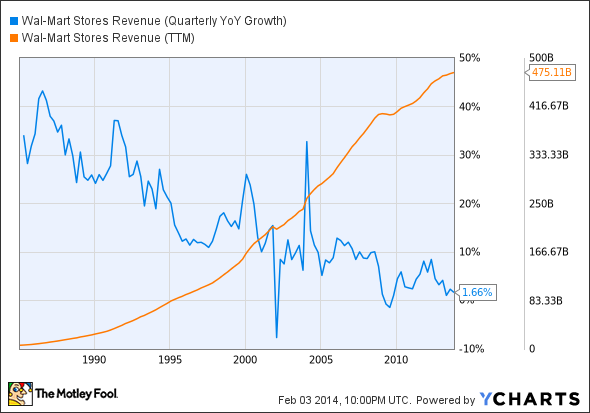 WMT Revenue (Quarterly YOY Growth), data by YCharts. That's not to say Wal-Mart has stopped growing entirely. Analysts expect it to report revenue of $478 billion for its recently ended fiscal year, up from $422 billion just three years ago. Wal-Mart's absolute sales growth of $56 billion over that time period actually beats Amazon's absolute growth of $40 billion in annual revenue. However, in percentage terms, Wal-Mart's compound annual growth rate for the last three years is a pedestrian 4%. In essence, Wal-Mart has become so big that it is basically impossible to move the needle. For example, it offered aggressive "doorbusters" on Thanksgiving this past holiday season, driving strong traffic that day. However, the company still turned in a weak sales performance for the full quarter because of macroeconomic factors. Wal-Mart already has such a large "wallet share" that its growth is tied firmly to economic growth. A gradual slowdown in revenue growth from 40% to 20%, and eventually to 10% and below, need not be alarming. In Amazon's case, though, there's plenty of risk, because many investors seem to think Amazon can maintain a 20% growth rate almost indefinitely. As a result, the stock price has been driven up over the years so that Amazon now trades for more than 80 times expected 2015 earnings. 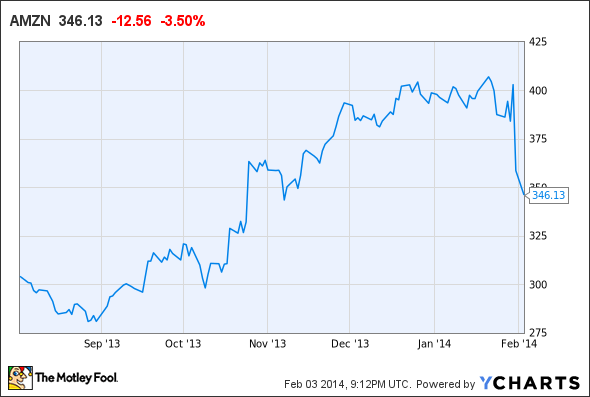 If growth falls short of bulls' lofty expectations, Amazon stock could have more room to fall. Whereas other mass retailers like Wal-Mart and Costco trade for around 0.5 times sales, Amazon trades for more than two times sales. Part of that premium is justified by the fact that Amazon is growing very quickly right now. However, even if Amazon's absolute revenue growth accelerates toward $20 billion a year in the next few years, its revenue growth rate would still cross into single-digit territory within less than a decade. By that point, if not earlier, Amazon will have trouble sustaining a lofty valuation premium. Amazon stock has been hit hard in the last few days because while growth has remained impressive, it has still fallen short of investors' expectations. Unfortunately, investors may be setting themselves up for future disappointments as well. For example, analysts at Credit Suisse still expect Amazon to maintain a nearly 20% revenue growth rate through the end of the decade! The law of large numbers argues otherwise. Amazon's absolute revenue growth has barely budged in the last three years, despite the introduction of key new products like the Kindle Fire line of tablets. Amazon's annual revenue growth is unlikely to hit the $30 billion rate that would be necessary to keep growth near 20% for even five more years. In other words, slowing growth is the new normal for Amazon.